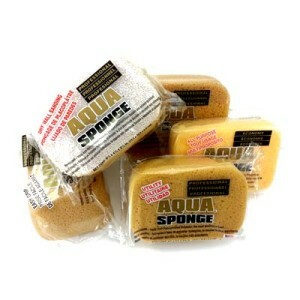 Our Aqua Sponge brand has become the choice of professionals and do-it-yourselfers for all kinds of projects. Polyester sponges are resistant to organic solvents, float, can be sterilized by boiling, and stay soft wet or dry. Our polyester sponges are made from hydrophilated polyester, the most absorbent foam. And because of our Aqua brand sponge’s utility, they are used for all types of masonry, painting, texturing and general cleaning projects; and are the preferred sponge of many professionals. Originating from Greece, our Aqua honeycomb polyester blend sponge offers a soft texture for wiping applications and maximum water retention for transferring water. Because Aqua brand sponges can be used for a wide variety of jobs and last through multiple projects, they are an exceptional value for the cost. Aqua brand sponges are widely used for laying tile, grout work, wall papering, painting, texturing, and general cleaning, as well as pottery and ceramic making. Because the honeycombed polyester Aqua Sponge is resistant to solvents, floats, remains soft, and is extremely durable, they are also an ideal choice for masonry, drywall applications, washing walls, and general cleaning. In addition, they are also great for all general home, auto and marine applications. Why Aqua Sponge Brand is made from Polyester? Polyester foam, which was invented in 1937 by Otto Bayer and affectionately referred to as “Ester”, is a dense foam that is absorbent, durable, cost effective, strong, and resistant to harsher cleaning chemicals, grease and oil. 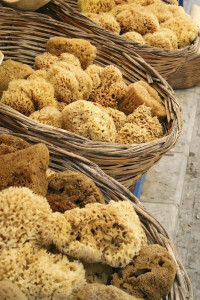 Similar in structure to natural sea sponges, this airy foam, was originally adopted by the mop industry and soon after adapted to making kitchen sponges. Sponges made from polyester are durable, light, elastic, economical and more chemically resistant compared to other types of sponges. Polyester sponges are soft, regardless of whether they are wet or dry, and are available in a variety of shapes and sizes for different applications.